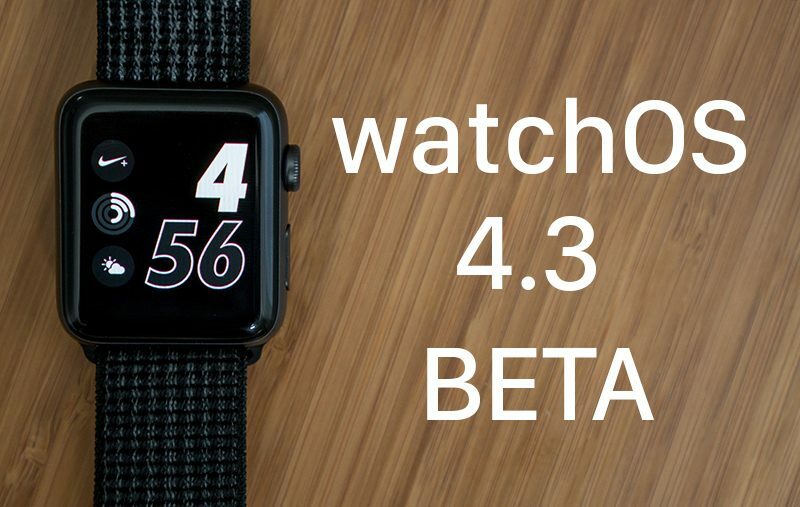 Apple today seeded the third beta of an upcoming watchOS 4.3 update to developers, two weeks after seeding the second beta and two days after releasing watchOS 4.2.3, a minor update focusing on bug fixes. To install the update, the Apple Watch needs to have at least 50 percent battery, it has to be placed on the charger, and it needs to be in range of the iPhone it's paired to. watchOS 4.3 introduces support for Nightstand mode in portrait orientation, a feature that was previously only available when the watch was placed in landscape orientation. There's also a new charging animation when the Apple Watch is placed on the charger, and your Activity data is now displayed on the Siri watch face. In watchOS 4.3 beta 3, the Apple Watch's battery complication more accurately reports battery life. In the release notes, Apple says the battery complication "no longer reports remaining battery percentage in increments of 5." The watchOS 4.3 update brings the return of a much-desired feature that allows music playing on the iPhone to be controlled using the Music app on the Apple Watch. In prior versions of watchOS, starting with watchOS 4, the Music app could only be used to control music playing on the watch itself. With tvOS 11.3 installed, there's also an option to control music playing on the Apple TV with the watch. Apple plans to release watchOS 4.3 to the public in the spring, and until then, it will be limited to developers. Apple offers public betas of tvOS, iOS, and macOS, but watchOS betas are not available for public beta testers. It's probably more to do with less people trying watchOS betas as there is no user-accessible rollback option. there’s a new app launch animation! Well it does fix the battery percentage in multiple of fives problem. I liked your statements although, I’d argue that adding back starting playback on the iPhone from the AW Music app is exciting. Ah yes, forgot about that. That's actually quite a huge addition. Siri broke on my Series 3 last night after the update. It won't respond to voice, have to hold down the Crown. Hey Siri broke on anyone else's watch? If you haven’t, restart the watch. Not much to get excited about with updates like these. Now WatchOS 5.. there's something to get excited about. Though the animation changes are super nice.. they need to make the charging animation the same for the iphone. Also, when turning on the watch, as soon as it jumps to the passcode screen, there’s also a haptic feedback now. This is good because the watch normally takes a long time to launch, and before I had to check if it’s launched 2 or 3 times. I think there’s 2 new haptic feedbacks (watch launch to passcode screen and the emergency menu), but not totally sure that they didn’t exist before (see my previous post). In general, this beta has been smooth so far on my Apple Watch series 2. I would agree that, in my opinion, the haptic just before the passcode screen is new.